The meat of the season really. Remember the lamb campaign advertisements? I really like lamb and with Spring upon us, I declare every night a lamb night! Hoorah! The following recipe is pretty much inspired by one of my favourite dishes in Izakaya Den. I have been there twice now, once with my foodie friends and the second time round with family. This is really quite a simple dish to make, provided you have the ingredients already in your pantry. Luckily for me, I did! Lamb ribs are not only delicious, they are also relatively cheap in comparison to other ribs sold at the butcher/supermarket/markets. It’s easy to cook and easy to eat. It’s also great as finger food at a party! To make the Miso marinade, simply put together all the ingredients into a mixing bowl. If you prefer to have a smooth marinade, blend the mixture in a food processor. I actually quite like having the chunky garlic bits, so I didn’t. 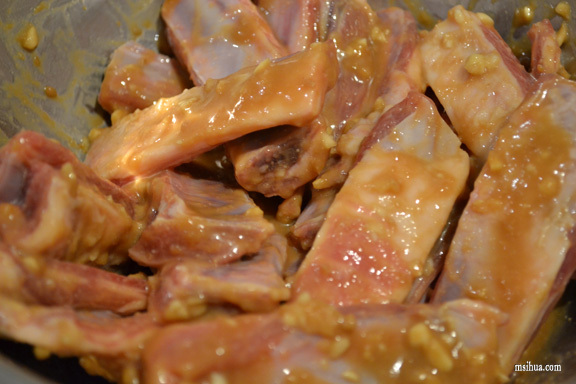 Marinate the lamb ribs with the Miso marinade for at least 2 hours and keep chilled in the refrigerator. Marinating overnight would give you a more intense flavour. To cook, simply heat up a bit of olive oil on the grill pan on high heat. Remember, you don’t have to use much oil at all, as the lamb ribs contain much fat which is seared during the cooking process. Place the lamb ribs onto the grill and cook for around 2-3 minutes each side. Alternatively, you can do this by cooking the ribs in a griller or in a toaster oven for about 10 minutes (turning the ribs over at the 5 minute interval). 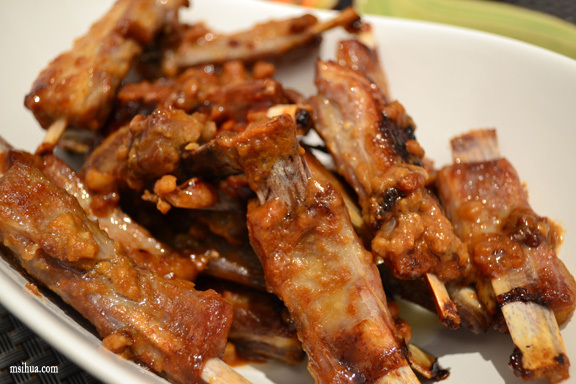 Once the Miso lamb ribs are cooked, merely plate them up and serve. Quick and easy, this is certainly a finger lickin’ crowd pleasin’ dish. So tell me my wonderful readers, what is your favourite lamb dish? It’ll be good on any meat with bone I reckon! My family loves lamb ribs. We cook them in a slow oven for ages to render out the fat, then turn the heat up to make them nice and crispy. I just happen to have some white miso in the fridge, and I think this recipe is calling it! Wuhoo!!! 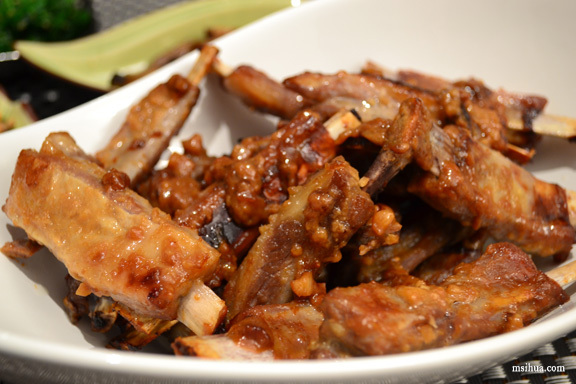 Any day with miso lamb ribs is a great day! Wow those ribs look like they would be pretty addictive! I love lamb, and yes, it must have a bit of fat on. Very important, that. Wuhoo… Glad to be of service! I just had din dins, but this post has made me peckish again… ai yah! Haahaha… late night supper it is then! I’m definitely going to be sending this link to my mum! She loves lamb, gnawing on bones, and her tomato allergies mean that most rib recipes are out of the question. Yay I-Hua! And I recall she likes Japanese food as well! Double Yayy! Yum! I am totally inspired. NOt making lamb ribs but hogget with a miso paste. You are a woman after my own heart! !